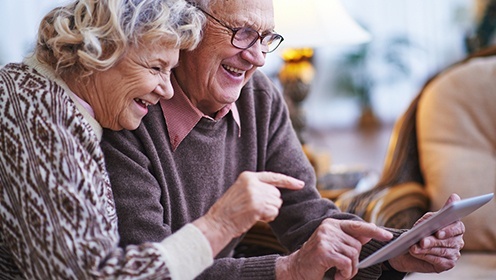 Today’s technological gadgets are a little daunting for most seniors. The thought of figuring out how to operate a cell phone or an iPad, much less any software known as “apps”, can be confusing for even the savviest technology guru. However, the fact is that everyone can benefit from all sorts of gadgets and programs. Social media sites such as Facebook, Skype, and Snapchat have the capabilities of connecting seniors to their families. Facebook allows its users to send messages, post pictures, and share live updates with contacts. Skype is a fantastic tool that allows its users to video message each others, which is optimal for those residing in a different state than their families. Snapchat is a new form of messaging that allows the users to send and receive photos instantly. The best way to think about tablets is to think of them as flat, portable computers. This will take some time to adjust to, but anyone can get the hang of it. Tablets can help set a reminder of an event or daily routine the user needs to partake in. Applications can be added to the tablet to promote brain health, communicate with family and friends, and most importantly, prevent boredom. Tablets can also be used as tools for searching a desired location, researching nearby doctors, or keeping up with local, national, or worldwide news. Most seniors do not own a video game console; however, many senior-living communities provide these to its residents in addition to games and art classes. It is very common to see video game consoles, for instance a Wii or Xbox, in the entertainment center next to the television. This is a great activity for seniors because it can help them improve their hand to eye coordination, muscle control, and memory. Many of the new gaming systems involve full body movements, which provide a fun way for seniors to exercise. A Fitbit is a wearable, technology-based device, that monitors certain activities individuals do throughout the day. Fitbits have the ability to record and monitor steps, pulse, sleep, and breathing. Based upon one’s health, it can also suggest breathing progressions and activities that are a best fit for one’s level of fitness. These devices are connected to cellular devices and are able to send feedback to the user through the application. There are new technologies available today, so it is important to research them and figure out which one(s) can provide the best aid. Our professional team members are always available at Regency Pointe Senior Living to clarify any questions, give helpful feedback, or provide updates on how we are actively implementing the use of the newest technologies into our seniors’ lifestyles.